Go to our booking form below! Last-minute availability often available! Book our award-winning round-the-clock transfers from Punta Cana airport to Bayahibe! The drive from Punta Cana to Bayahibe takes about an hour in one of our comfortable air-conditioned vans or buses, and it's a good road all the way! Get into our van or bus, and enjoy your prebookable chilled water, beer or celebrate with a bottle of bubbly whilst being driven in comfort to your hotel or villa in Bayahibe or La Romana. 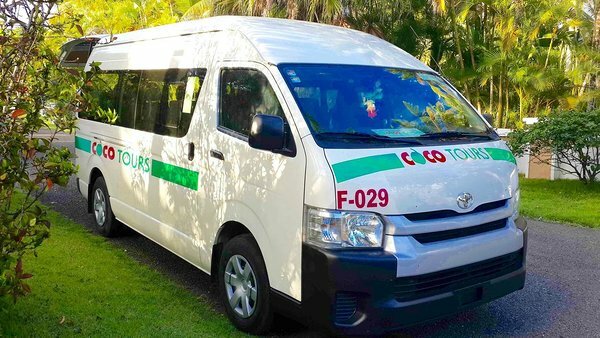 If you would like a quotation for transfers from Punta Cana to Bayahibe, or any other Dominican airport transfer, please just drop us a line on transportation@cocotours.com.